The Village of Hales Corners possessed a strong identity from 1836, when the first white settlers arrived, but it did not attain legal independence until 1952. The area that is today Hales Corners was initially part of the Town of Lake and then the Town of Kinnickinnic (renamed Greenfield in 1841), which included present day FRANKLIN and GREENFIELD. The Village of Hales Corners sought legal separation first in the 1920s and again in the 1950s, when citizens formally incorporated. Members of the Hale family from New York State were the area’s first white settlers in the 1830s. Seneca Hale arrived in 1836, followed by his brother, William, and father, Ebenezer. The Hales obtained the ownership rights to three-quarters of the land that now surrounds Highway 100 and Janesville Road. When William Hale became the area’s first Postmaster in 1854, they called the settlement Hale’s Corners. The apostrophe in the name was used until at least 1898. Hales Corners became a crossroads community between Milwaukee and the lead mines in southwestern Wisconsin. Starting in 1848, the Janesville Plank Road, a toll road, ran through Hales Corners. 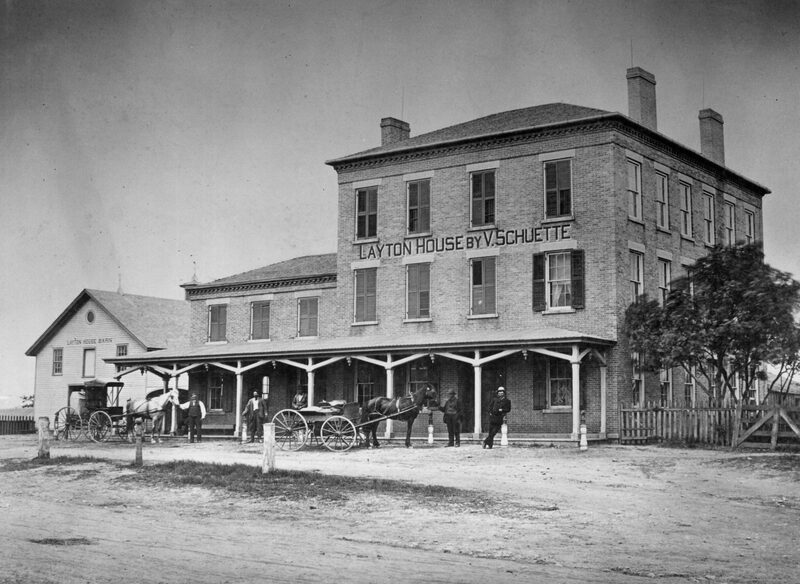 Hotels serving travelers opened near the intersection of Janesville Plank Road, and Harris or Muskego Road, forming the commercial center of Hales Corners (now the intersection of Janesville Road and Forest Home Avenue). Farms surrounded the business center of Hales Corners. These farms initially grew wheat, but dairying became common around the Civil War. Starting in 1871, a monthly stock fair attracted visitors to Hales Corners. Popular products included livestock, food, and crafts. Because of residents’ complaints about traffic and vagrants, the fair moved to St. Martins (in Franklin) in 1958. In 1903, THE MILWAUKEE ELECTRIC RAILWAY AND LIGHT COMPANY connected the somewhat rural Hales Corners to Milwaukee with the first public transit line to the village. In 1927, Hales Corners became an unincorporated village but remained legally part of Greenfield. In the early 1950s, residents of many suburban communities became concerned that the City of Milwaukee would try to annex them. In order to protect its independence, tax rates, and local service levels, Hales Corners incorporated as an independent village in 1952. Four successive annexations made Hales Corners the 3.2 square miles that it remains in the twenty-first century. The population at the time of incorporation was 1,382 people. Hales Corners’ population has grown to 7,692 people in 2010, with almost 60 percent living in owner-occupied homes. One of the main attractions in Hales Corners is CHARLES B. WHITNALL Park, which is part of the Milwaukee County Parks system. The park is just under one square mile and is partially located in Franklin. The county began purchasing farm land on this site in 1928 and constructed the initial park with money from the federal New Deal programs. Today, Whitnall Park contains a golf course, the BOERNER BOTANICAL GARDENS, and the Wehr Nature Center, along with picnic areas, trails, a sledding hill and playground. ^ Vera Shepherd and Ed Weiler, ed., Hales Corners, Wisconsin: A History in Celebration of 150 Years (Hales Corrners, WI: Hales Corners Historical Society, 1988), 3. ^ Ralph D. Olive, “Hales Corners Reflects Pastoral Past,” Milwaukee Journal, July 12, 1988, accessed August 10, 2014, http://news.google.com/newspapers?nid=1499&dat=19880712&id=zmcaAAAAIBAJ&sjid=xioEAAAAIBAJ&pg=5561,2659111. ^ Ralph D. Olive, “Hales Corners: Suburb with a Park Right at Its Backdoor,” Milwaukee Journal, March 7, 1985, accessed August 11, 2014, http://news.google.com/newspapers?nid=1499&dat=19850307&id=mWcaAAAAIBAJ&sjid=TSoEAAAAIBAJ&pg=3258,6024818. ^ Shepherd and Weiler, Hales Corners, Wisconsin, 4. ^ Shepherd and Weiler, Hales Corners, Wisconsin, 5. ^ Shepherd and Weiler, Hales Corners, Wisconsin, 5, 76. ^ William Janz, “Hales Corners Stresses Crossroads Comfort,” Milwaukee Sentinel, February 11, 1963, accessed August 10, 2014, http://news.google.com/newspapers?nid=1368&dat=19630211&id=fE0aAAAAIBAJ&sjid=txAEAAAAIBAJ&pg=7428,2365990; “Hales Corners Fair Draws 40,000; May Be Last One,” Milwaukee Journal, September 4, 1956, accessed August 10, 2014, http://news.google.com/newspapers?nid=1499&dat=19560904&id=oeRQAAAAIBAJ&sjid=diUEAAAAIBAJ&pg=5398,1273664; Shepherd and Weiler, Hales Corners, Wisconsin, 10. ^ Shepherd and Weiler, Hales Corners, Wisconsin, 10. ^ John Gurda, The Making of Milwaukee (Milwaukee: Milwaukee County Historical Society, 1999), 340. ^ “Hales Corners to Push Incorporation,” Milwaukee Sentinel, February 27, 1951, accessed August 10, 2014, http://news.google.com/newspapers?nid=1368&dat=19510227&id=LHFQAAAAIBAJ&sjid=LRAEAAAAIBAJ&pg=5826,2838729. ^ “Hales Corners to Push Incorporation,”; “Welcome to Hales Corners,” Village of Hales Corners, accessed August 29, 2014, http://www.halescorners.org/. ^ Wisconsin Legislature, Legislative Reference Bureau, The State of Wisconsin Blue Book (1952), 532. ^ Community Facts Bureau, U. S. Census, “American FactFinder—Results,” accessed August 29, 2014. ^ “The Parks System (maps),” Go Milwaukee, Milwaukee County website, accessed August 29, 2014. ^ Shepherd and Weiler, Hales Corners, Wisconsin, 103. ^ “Whitnall Park,” Milwaukee County Parks System website, accessed August 12, 2014. Gurda, John, Randy Sannes, Kathy O’Brien, and Hales Corners Historical Society. Hales Corners, Wisconsin: A History of the Village since 1837. Hales Corners, WI: Hales Corners Historical Society, 2015. Shepherd, Vera, and Ed Weiler, ed. Hales Corners, Wisconsin: A History in Celebration of 150 Years 1837-1987. Hales Corners, WI: Hales Corners Historical Society, 1988.